When people get a new phone, their old one often collects dust in some drawer in their house because they aren’t sure what to do with it. For victims of domestic violence, a donated cell phone can be their lifeline. A phone allows them to call 911 or other support services, as well as any friends or family who might be able to help them. Abusers try to isolate victims, but a cell phone is a way for victims to feel safer and less alone. The National Network to End Domestic Violence reports that domestic violence hotlines nationwide typically receive about 20,800 calls a day, and victims need access to a phone to get that help. Cathy Haney is the Domestic Violence Chairman of The Woman’s Club of Parsippany Troy Hills (New Jersey), and says the cause is dear to many of her club members’ hearts. Twice a year, the club has a drive to collect cell phones and other electronic products, such as iPads and iPods. 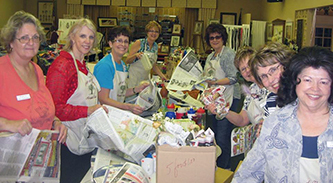 They place collection boxes with explanatory signs in restaurants, banks, dry cleaners, and other frequently visited establishments, and after a month, the club sends the collection to a non-profit recycling agency. The agency assigns a value to each item and sends a total check to a charity that the club designates, in this case, the Jersey Battered Women’s Service (JBWS) of Morris County. In addition to the phone collection, the club completes several projects each year to support JBWS and help both the women and children in JBWS safe residences. Cathy says that unfortunately, as time goes on, the monetary value of non-smart phones have been decreasing, and people are less likely to donate their smart phones now that trade-ins and trade-ups are available. So while the club’s April drive yielded an impressive 78 items, the remuneration was less than they might have hoped. To make a change, Cathy has been trying to find a group that sends used, re-programmed electronic devices directly to victims of domestic violence, as the cell phones would likely be more useful that way. Programs like that are harder to come by then the recycling programs. HopeLine from Verizon collects phones to recycle and resell, with the proceeds both funding non-profit agencies, and also being used to purchase phones for victims of domestic violence that are distributed to shelters and social service agencies. It’s not environmentally sound to discard your cell phone, so recycling is the way to go. With programs that will put the phones, or the proceeds of the phones, towards someone who might desperately need it, it is a win-win situation. The Woman’s Club of Parsippany Troy are committed to making sure old cell phones don’t go to waste, and you can be too!